Global economic growth is moderating as disparities in the economic dynamics of advanced and emerging economies persist and become more pronounced, says the Rheinisch-Westfälisches Institut für Wirtschaftsforschung (Rhine-Westphalia Institute for Economic Research), also known as RWI, a center for scientific research and evidence-based policy advice, based in Essen, Germany. World economic growth accelerated at the end of 2013. Production has increased especially rapidly in the advanced economies. The rebound of the US economy has further improved since the summer of 2013. Similarly, the much-awaited recovery of the Eurozone nations has materialized. Japan, on the other hand, continues to struggle. The emerging economies have not yet reached pre-recession levels, despite benefiting from expanding exports to the advanced economies. Current economic policy is expected to help sustain the current upswing. “While monetary policy is likely to remain expansionary, fiscal policy in advanced economies is expected to become less restrictive,” the RWI wrote. The advanced economies will benefit from improved conditions after their governments have finalized their adjustment processes in response to the financial crisis. However, more restrictive monetary policy will begin to reduce aggregate demand in the next year. The Eurozone is forecast to recover further from its sovereign debt crisis. However, some Eurozone Member States that have been hit particularly hard by the crisis will probably remain inhibited because their structural adjustments are still underway. 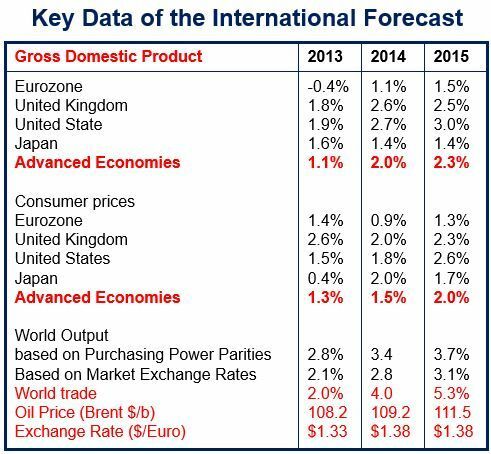 World GDP (countries’ gross domestic product weighted in terms of purchasing power parity) is forecast to increase by 3.4% in 2014 and 3.7% in 2015. While international trade in goods is expected to rise by 4% in 2014 and 5.3% in 2015. The OECD has forecast 3.1% GDP (annualized) growth for the US during Q2 2014, 2.4% for Canada, 3% for the United Kingdom, 2.5% for Germany, and much slower rates for France, Italy and Japan.